Auntie Leila, homeschooling sage and speaker of time tested family truths, asked me if I wanted to host a giveaway of her beautiful new book, The Little Oratory: A Beginners Guide to Praying in the Home, and I enthusiastically said, "Yes!!!" When someone like Leila writes a book about beauty and faith education in the heart of a home, I listen and so should you! That's my best advice… listen to someone who has been there and has the spit-up stripes on their shoulders and the transcript ink smudges on their fingertips to prove it before you get caught up in the latest untested homeschooling craze. My "working" oratory just above my kitchen sink: Our Lady of the Angels, The Irish Madonna of Hungary, a tiny Infant of Prague statue, some St. Joseph's oil and a rosary bracelet. I guess I've always had a little oratory of sorts in our home without really knowing what that was. Something I've discovered, which I hope a more in depth study of this book will help me reconcile, is that some places in a home lend themselves to being a more decorative place for an oratory but maybe not the most useful. That is what I always struggle with; form vs. function, you know? Maybe you don't. I tend to think it's a problem that us visual people struggle with mostly. For example, this space is perfect from a decorative standpoint. 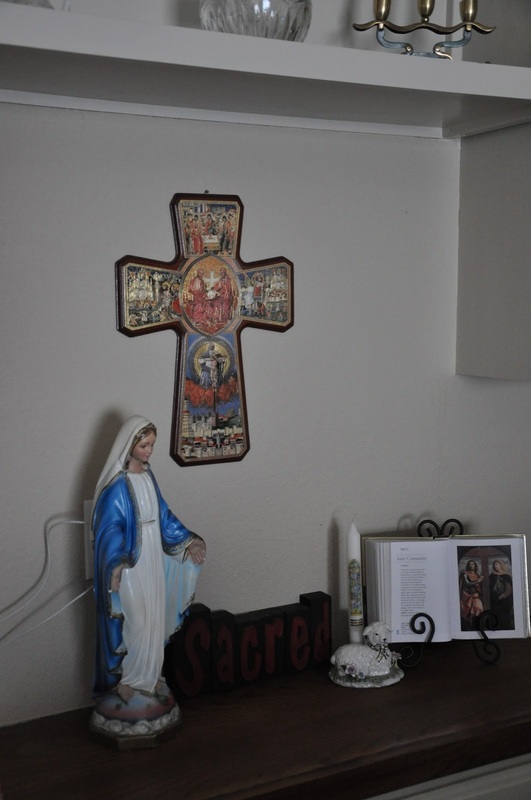 It's a blank wall space (with the exception of the outlets behind the Blessed Virgin) with a lovely wooden counter below it but it sits in an area of our house that is like an open hallway. It's a pass through area called a dry bar. Across from it is a dual height counter that we use for serving food whenever we host a function. We could put some bar stools opposite it in order to help direct the sitter's gaze towards this wall but bar stools just don't seem conducive to quiet prayer to me. There is no place for chairs or even a kneeler. I like the idea of a corner so much better but haven't been able to find one that I can make work in this house. That's where I'm hoping that The Little Oratory can guide me. For right now, I personally prefer a working oratory like the one above my kitchen sink but I'd like to find something that's more of a space for our whole family to use. That will be my challenge. In the book, they talk about using the little oratory to pray the Liturgy of the Hours. Yes, Auntie Leila… I admit… I quailed, I'm sorry!! I'm trying to leave my mind and heart open to the idea but I've never really embraced the "domestic monastery" view of the family but rather the "find a heaven amidst pots and broomsticks" view instead. Maybe it's because we attend Mass at a Cistercian Abbey and have heard the monks pray morning prayers before daily Mass that it seems like an aspect of our faith that is particularly well-suited to the religious life, something not really intended for a family with young children. I can see a couple in their retiring years embracing some of the aspects of monastic life, but I've never felt particularly called to the movement that imposes monastic like silence and seriousness on a day when babies are crying and toddlers need help wiping. I freely admit that this is more than likely my own personal challenge to conquer. Like I said, maybe I need to educate myself better about what the Liturgy of the Hours really are and do some more praying about it. I do want to find a way to help my children feel comfortable with moments of quiet meditation, contemplation or prayer throughout the day. And I look at Leila's advice on family and education as words from the wisest of wizards. She's been there and done that. so I'm hoping that as I delve further in TLO some of these questions will be answered. See what I mean… meaty! 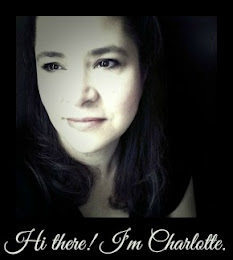 Find more great reads over at Jessica's place!